Berkshire's proximity to London means that its varying architecture contrasts contemporary metal and glass architecture against the traditional wooden stair parts in staircase design. Pear Stairs is able to easily cater to both of these tastes. Slough, in the north east of Berkshire, is home to Europe’s largest trading estate and the second largest in the world. It is a commercial and industrial hub in traditional Berkshire which has more company headquarters than anywhere else in Britain. As well as residential properties, Pear Stairs can easily design staircase for office and commercial buildings. The modern and impressive offices that reside in Slough use glass as a major feature of their architecture. Glass can also play a role in the staircases of these buildings, with glass side panel stair parts available at Pear Stairs. 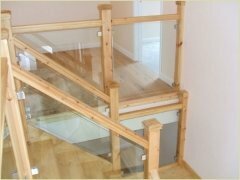 Pear Stairs’ glass stair parts can be cut to any size and shape to fit your staircase. We use 10mm toughened glass to build our glass staircases, which can also have either curved or sharp corners. Another way to incorporate modernity into the staircase designs of offices such as Blackberry, O2 and Amazon, which reside in Berkshire, is to use FUSION stair parts. As well as bringing a unique, modern feel, FUSION stair parts are quick and easy to assemble as the nickel newels are ready to use. FUSION stair parts are truly unique, using sleek nickel connectors to fix the rails and newels together. 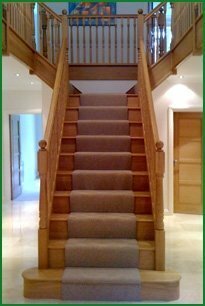 We have a great selection of FUSION stair parts available in Berkshire. In contrast to the industrial and commercial side of Berkshire it also houses the Royal boroughs of Windsor and Maidenhead. Windsor is home to Windsor Castle which has the large ‘grand staircase’, attracting visitors each year. A grand staircase, like the one in Windsor, can add huge value to your home. Pear Stairs allows you to custom build your own bespoke staircase from our range of stair parts, including imperial spindles and chamfered newel caps. Each stair part is available in a number of materials, including oak, pine and ash. We at Pear Stairs pride ourselves on excellent customer service and stairs knowledge, so if you have any queries when designing your luxury stairway, just give us a call for a friendly chat. 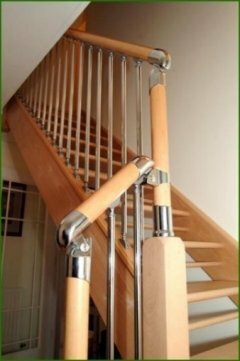 Whatever type of building you are designing a staircase for in Berkshire, Pear Stairs has a wide variety of stair parts which can be put together to build a unique and interesting staircase. Take a look at what we have available in our on-line shop .